Update: The current sign-up bonus for the Amtrak Guest Rewards World MasterCard is 12,000 points after spending $500 in the first 3 months, 2 points per dollar spent on Amtrak, and one point per dollar on everything else. Following up on his post about Maximizing Amtrak Guest Rewards Points: Earning, TPG Contributor Jason Steele delve into the various ways to make the most of your Amtrak Guest Rewards points redemptions as well as the loyalty program’s hotel partners. Amtrak’s award travel chart is remarkably simple. The country is divided up in a zone chart that primarily includes the Western, Central, and Eastern zones. Most awards are priced depending on how many zones they cross. Thankfully, Amtrak counts several major cities as sitting in two zones, which allow single-zone awards to apply to travel in either direction. 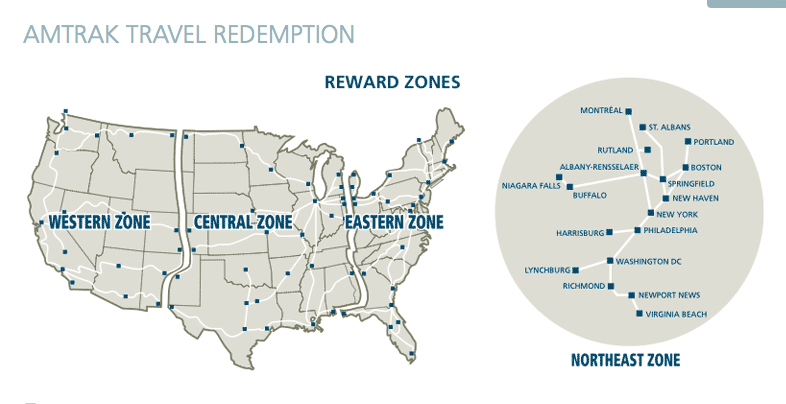 Amtrak splits its redemption map into distinct zones, sort of like a distance-based frequent-flyer program. Travel can be in Coach Class, Business Class, Roomette, or Bedrooms. When redeeming an award for a Roomette or a Bedroom, all passengers traveling in that room have their meals are included. Roomettes contain reclining seats that convert into bunk beds that sleep two, while Bedrooms can sleep two adults and one small child and have private bathrooms. Awards are for travel in one direction and no free stopovers are allowed. I took some sample trips and calculated the value per point based on the price offered on the dates I chose. Fortunately, Amtrak pricing is much more consistent than the airline, and awards are available for any unsold seat or bedroom, with the exception of a number of blackout dates. As you can see, Roomette and Bedroom awards within one zone offer the best value at 4.28 cents per point. A bedroom sleeps two adults in a 3’4”-wide lower bed and a 2’4”-wide upper bed and has a private bath with a shower. Two adjoining bedrooms can be booked separately and opened up into a suite. A roomette is essentially a bunk bed with access to shared bathrooms, although the roomettes on Viewliner trains have a small private toilet but no shower. Fortunately, Amtrak’s coach seats are more spacious than the airline’s domestic first class seats. But even if you could endure seated accommodations on a multi-day trip across two zones, this award would return the least value at only 1.95 cents per point. Finally, all awards are vastly superior to the one cent per point received when redeeming American Express Membership Rewards points for Amtrak gift cards. As with airline miles and credit card points, there are other options for redeeming Amtrak points. They include hotel night stays, car rentals, or gift certificates, and are worth one cent per point or less. Amtrak elite members and credit cardholders can transfer Guest Rewards points to Hilton HHonors and Choice Privileges. Hotel point transfer options: Amtrak’s program allows point transfers to the Hilton HHonors and Choice Privileges programs. 5,000 Amtrak points can be redeemed for 15,000 Choice Privilege points or 10,000 Hilton HHonors points. Sadly, the hotel point transfer options are restricted to Amtrak elite members and holders of their Guest Rewards credit card from Chase. Elite members have an annual transfer limit of 50,000 points and Chase cardholders must spent $200 per year on the card and are limited to 25,000 points transferred per calendar. Still, cardholders could use their 12,000-point sign up bonus and 42,000 other points transferred from Ultimate Rewards or Starwood to earn 100,000 Hilton HHonors points by maxing out the 25,000 annual limit this year and again in the new year. That would be like earning 2.38 Hilton HHonors points per Ultimate Rewards or Starpoint. For most redemptions, HHonors points are valued at 1-1.5 cents each, returning as much as 3.5 cents per point, a respectable value. This option can be an exceptional value if you are redeeming HHonors points for GLON and AXON awards. However, considering the bonus Hilton points you could earn by simply getting one of their co-branded credit cards, this redemption option still isn’t that attractive. Members of Guest Rewards can also redeem points for one-night stay certificates at Hyatt and Starwood. 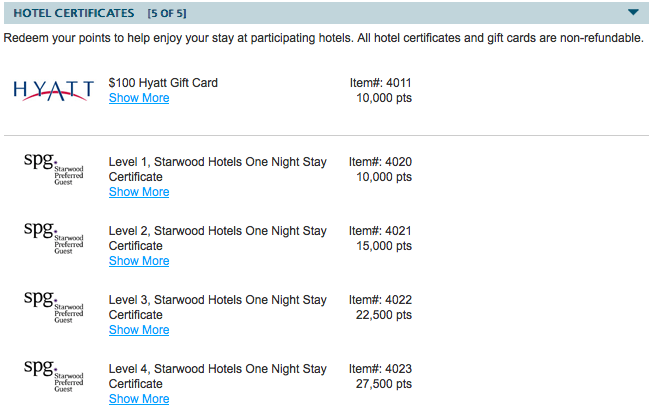 10,000 points gets you a $100 Hyatt gift card – so one cent in value each – or one night in a Starwood Category 1 property; that would make the ratio of Amtrak to Starwood points 1 : 0.3 since Category 1 properties require just 3,000 points for a free night. Starwood Category 2, 3 and 4 free nights require 15,000, 22,500 and 27,500 Amtrak points respectively. Car rental certificates: Amtrak points can also be exchanged for Hertz car rental certificates. 6,000 Amtrak points gets you a $50 certificate (0.83 cents each point), and 10,000 points gets you $100 (much better at 1 cent per point). Cruise certificates: Another interesting redemption option is to use Amtrak points for cruise certificates. A Premium 7- or 8-day Cruise certificate with Carnival costs 175,000 points (so between 21,875-25,000 points per day), a Superior 3-Day Carnival Cruise certificate costs 75,000 points, and you can redeem 10,000 Amtrak points for a $100 Celebrity Cruise certificate. Retail/entertainment options: Amtrak also has partnerships with various retain and entertainment outlets where Guest Rewards members can redeem points for certificates and gift cards in various denominations. Partners include AMC Theaters, Barnes & Noble, Bloomingdales, Gap, Macy’s, Olive Garden, Pottery Barn, Ruth’s Chris Steakhouse, Sports Authority and Staples among others. At all of them, redemptions are 6,000 points for $50 gift cards, or 10,000 points for $100 gift cards. So Amtrak redemptions aren’t just about train travel, but as you saw in my redemption analysis above, train travel can reap the greatest value from Guest Rewards points. Stay tuned for my next post about my actual Amtrak redemption and the trip I took using my points.